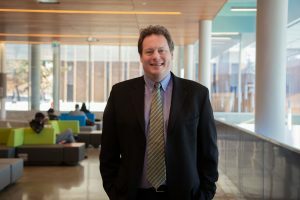 Professor McMurtry has been a member of the York University community since 1997. He is an Associate Professor in the Department of Social Science and a member of the Faculty’s Business and Society (BUSO) program. He has a long record of service to the university, from serving on the executive committees of both CUPE 3903 and YUFA to taking on roles as Department Chair of Social Science from 2014-15, graduate program director of Social and Political Thought from 2012-15 and coordinator of BUSO from 2007-10. From 2016-2018, he served as the Faculty’s Associate Dean Programs. As Associate Dean, he was responsible for curriculum and programs, student recruitment and enrollment management, the Markham Campus and served as Acting Dean on a number of occasions. Professor McMurtry was appointed Interim Dean of the Faculty of Liberal Arts & Professional Studies October 1st, 2018. Professor McMurtry holds MA and PhD degrees in Social and Political Thought from York University. His research and teaching interests focus on the theory and practice of alternative social, political and economic forms. His publications include 23 solo and co-authored articles and book chapters, and he is editor of the books Living Economics: Canadian Perspectives on the Social Economy, Co-operatives and Community Economic Development and Co-operatives in a Global Economy. He has given talks in South America, across North America and Europe, and in India. In addition, he was English language editor of the Canadian Journal of Non-Profit and Social Economy Research from 2015-18 and has been involved in multiple SSHRC grants, including as principal investigator on People, Power, Planet: Best Practices and Knowledge Mobilization in Community Energy Development. He was also the recipient of the Dean’s Award for Outstanding Service to Students in 2008 and in 2011 the Ontario Co-operative Association Spirit Award for Outstanding Service to the Ontario Co-operative Association.